The Met Bar & Grill is an offspring of the "modern" steakhouse, which serves world-class meat with an innovative twist. 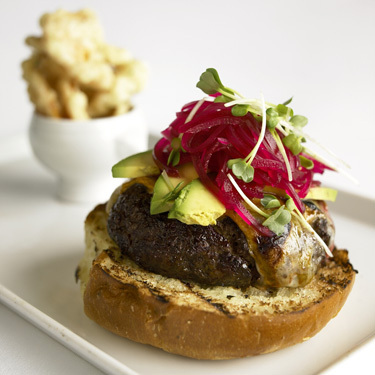 Located at the new Natick Collection, The Met offers creative takes on traditional American fare. Besides scrumptious steakhouse options, The Met Bar & Grill will transport guests on a worldwide "burger journey" across the globe with The Met Burger Bar. Executive Chef Todd Winer debuts the Met's new trademarked cooking method, the vertical grill, which helps enhance the flavor of the burgers by cooking them upright rather than flat. Guests will begin their burger experience with a selection of the finest blends of beef available, then choose from a variety of artisanal cheeses and fresh buns. Keep it simple, or go for the more elaborate, custom burger by choosing ingredients from around the world. Come to The Met Bar & Grill and relax in the beautiful surroundings featuring plush materials and state-of-the-art technology. The rich, warm interior has sophisticated twists - details include copper accents, dark wood, vibrant colors, sumptuous fabrics, embossed red alligator barstools and murals of world-class cities. Stadium style seating overlooking the open kitchen gives diners an up-close look at the inner workings of a bustling restaurant, a one-of-a-kind dining experience.